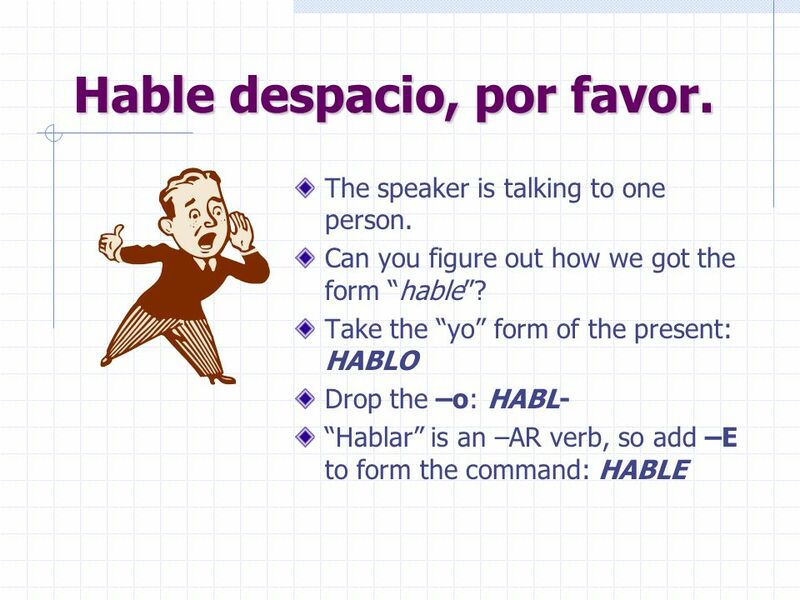 In this presentation, you will learn about making commands in Spanish. 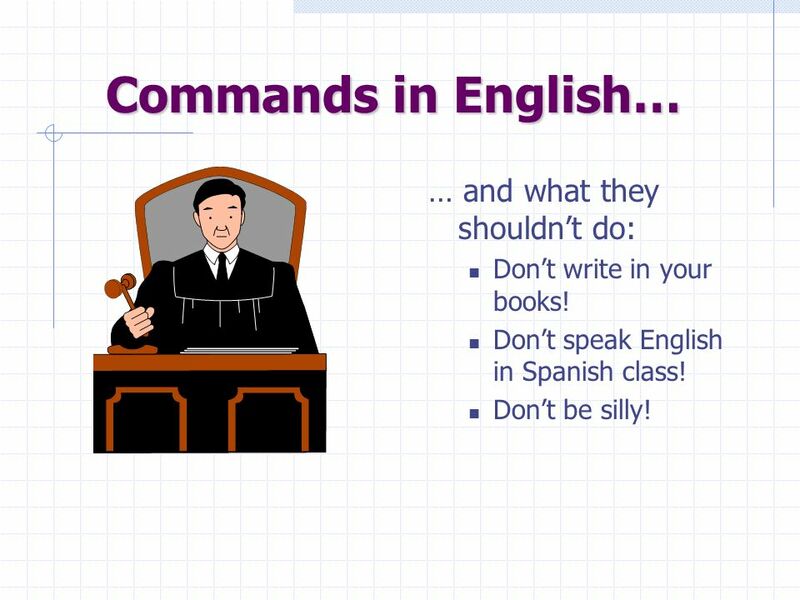 2 Commands in English… … are pretty easy. 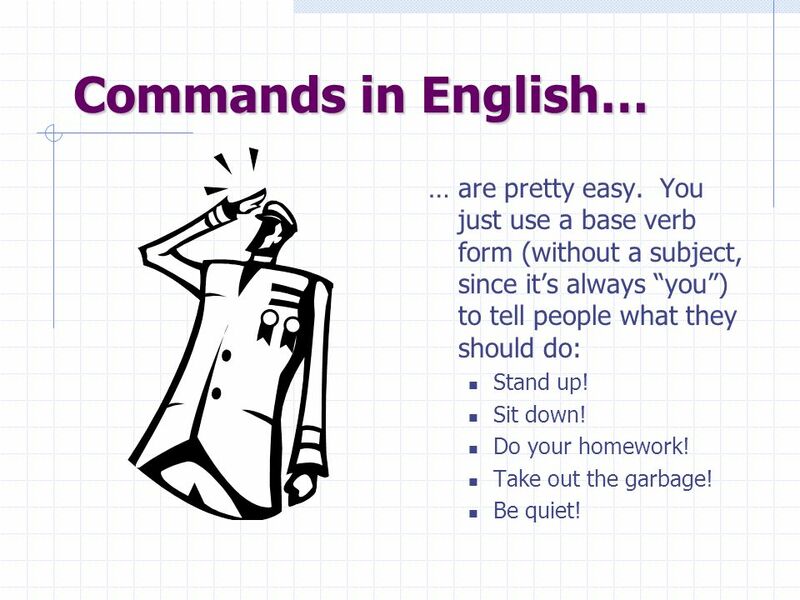 You just use a base verb form (without a subject, since it’s always “you”) to tell people what they should do: Stand up! Sit down! Do your homework! Take out the garbage! Be quiet! Don’t write in your books! 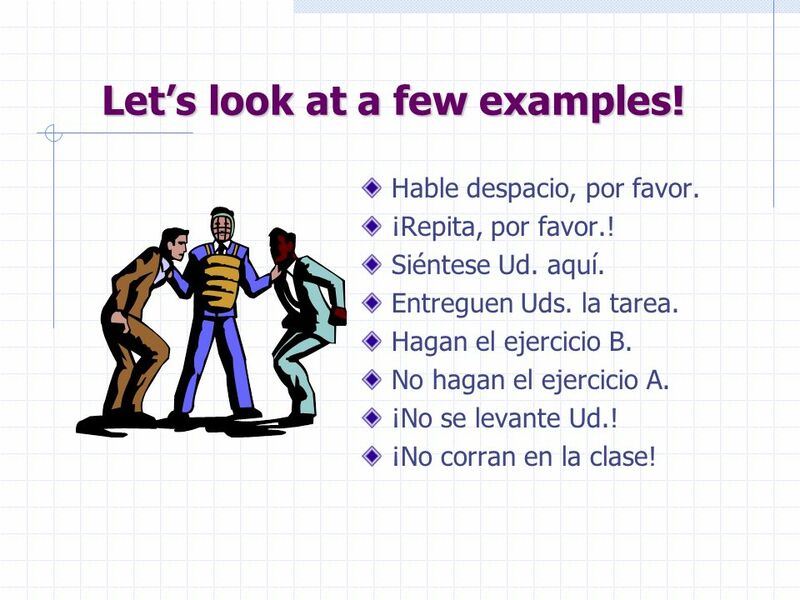 Don’t speak English in Spanish class! Don’t be silly! 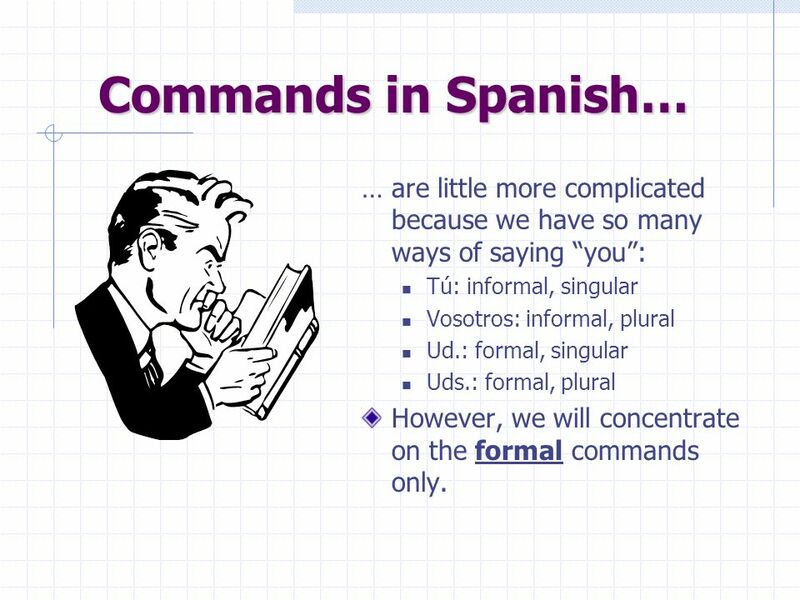 4 Commands in Spanish… … are little more complicated because we have so many ways of saying “you”: Tú: informal, singular Vosotros: informal, plural Ud. 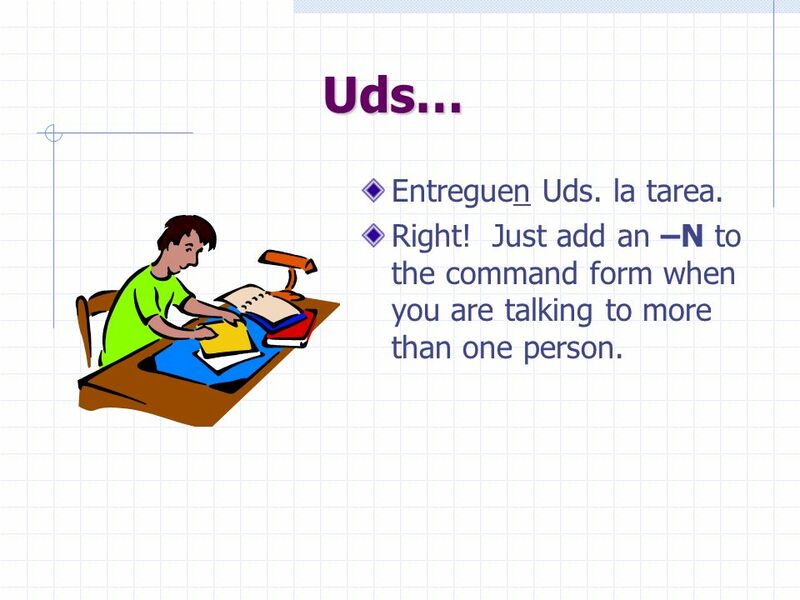 : formal, singular Uds. : formal, plural However, we will concentrate on the formal commands only. 5 Let’s look at a few examples! Hable despacio, por favor. 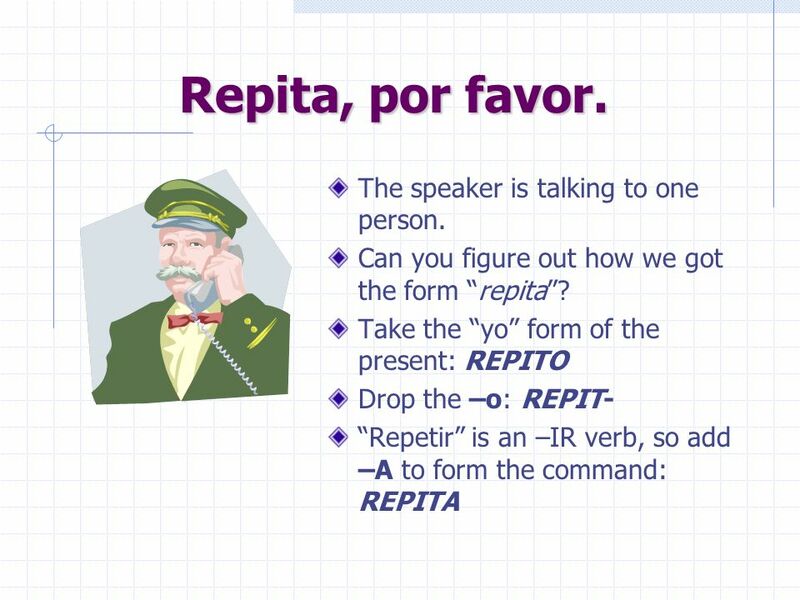 ¡Repita, por favor.! Siéntese Ud. aquí. Entreguen Uds. la tarea. Hagan el ejercicio B. No hagan el ejercicio A. ¡No se levante Ud.! ¡No corran en la clase! 6 Hable despacio, por favor. 7 Repita, por favor. The speaker is talking to one person. 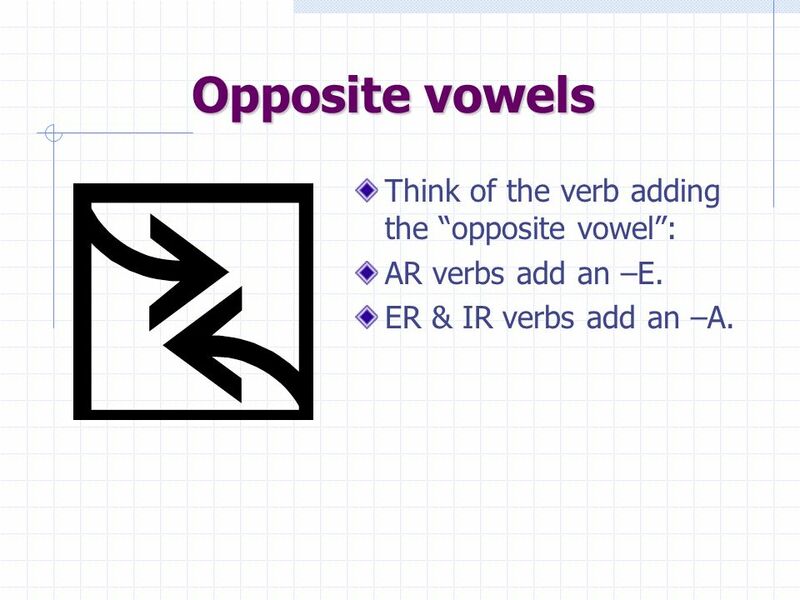 AR verbs add an –E. ER & IR verbs add an –A. 9 Let’s try a couple! 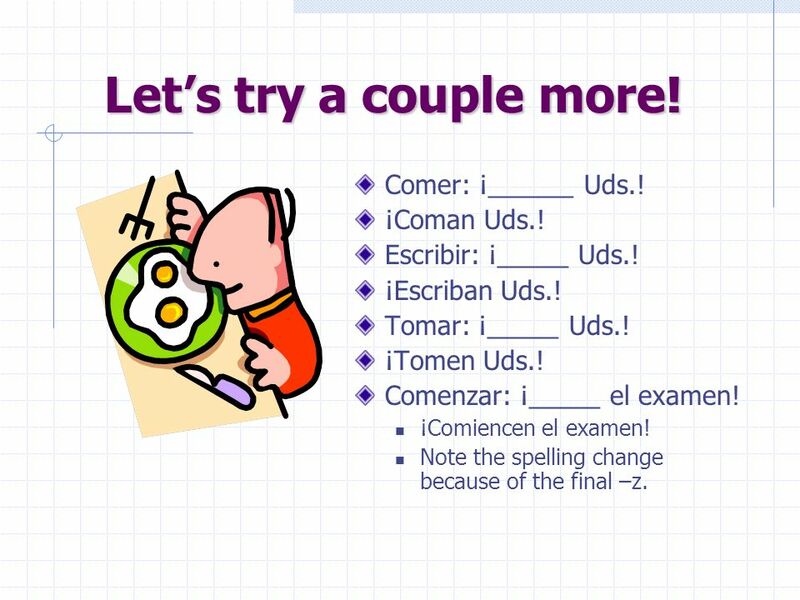 Comer: ¡______ Ud.! ¡Coma Ud.! Escribir: ¡_____ Ud.! ¡Escriba Ud.! 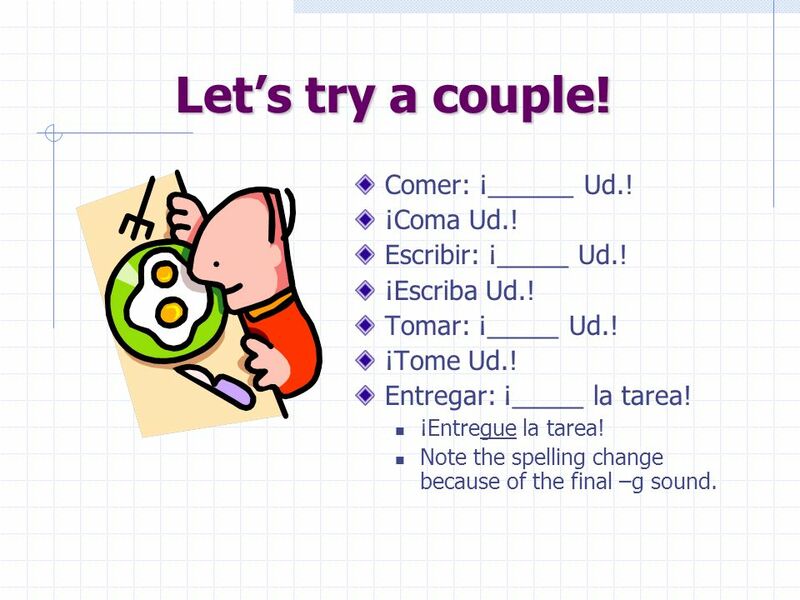 Tomar: ¡_____ Ud.! ¡Tome Ud.! Entregar: ¡_____ la tarea! ¡Entregue la tarea! Note the spelling change because of the final –g sound. 10 Uds… Entreguen Uds. la tarea. Right! Just add an –N to the command form when you are talking to more than one person. 11 Let’s try a couple more! Comer: ¡______ Uds.! ¡Coman Uds.! Escribir: ¡_____ Uds.! ¡Escriban Uds.! Tomar: ¡_____ Uds.! ¡Tomen Uds.! Comenzar: ¡_____ el examen! ¡Comiencen el examen! Note the spelling change because of the final –z. 12 ¡Levántese! 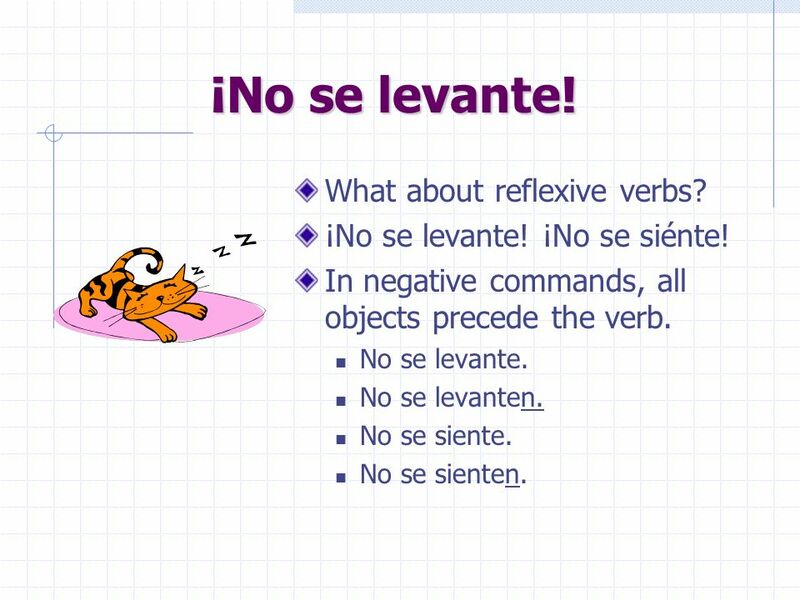 What about reflexive verbs? ¡Levántese! / ¡Siéntese! 13 ¡No! 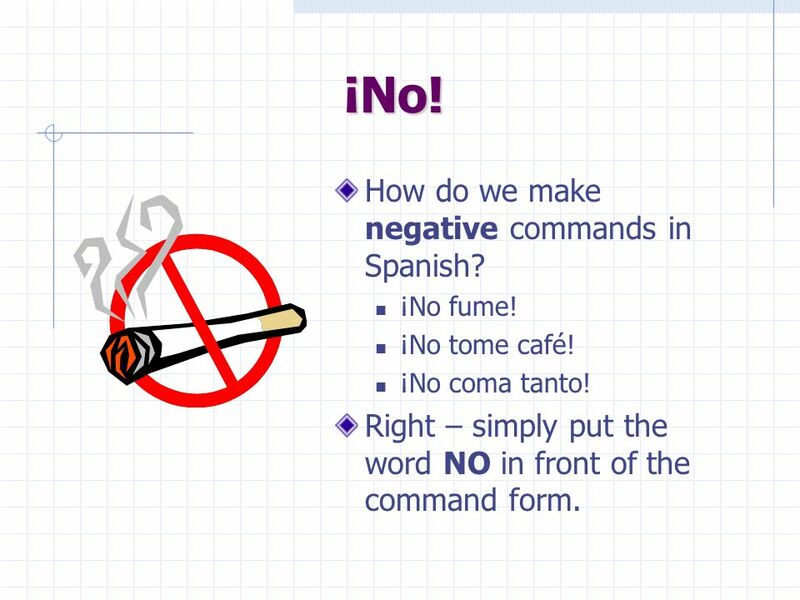 How do we make negative commands in Spanish? ¡No fume! ¡No tome café! ¡No coma tanto! Right – simply put the word NO in front of the command form. 14 ¡No se levante! 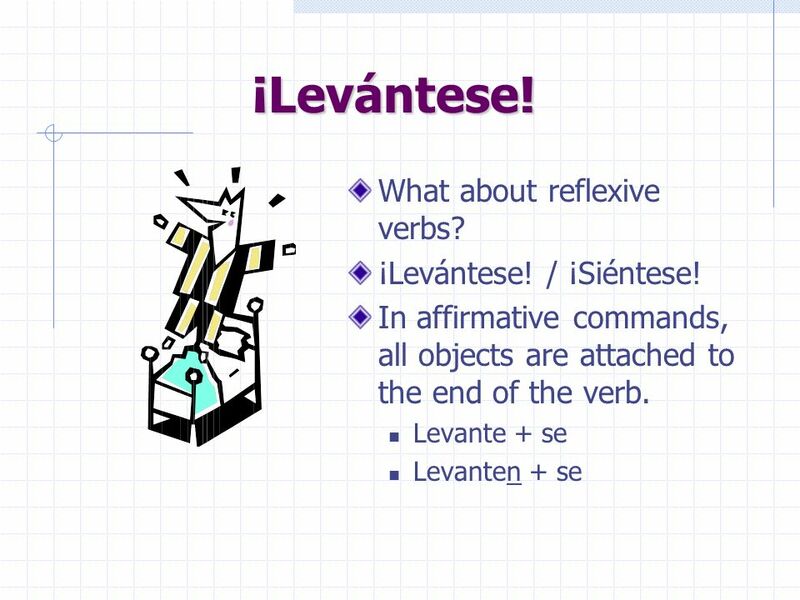 What about reflexive verbs? ¡No se levante! ¡No se siénte! In negative commands, all objects precede the verb. No se levante. No se levanten. No se siente. No se sienten. 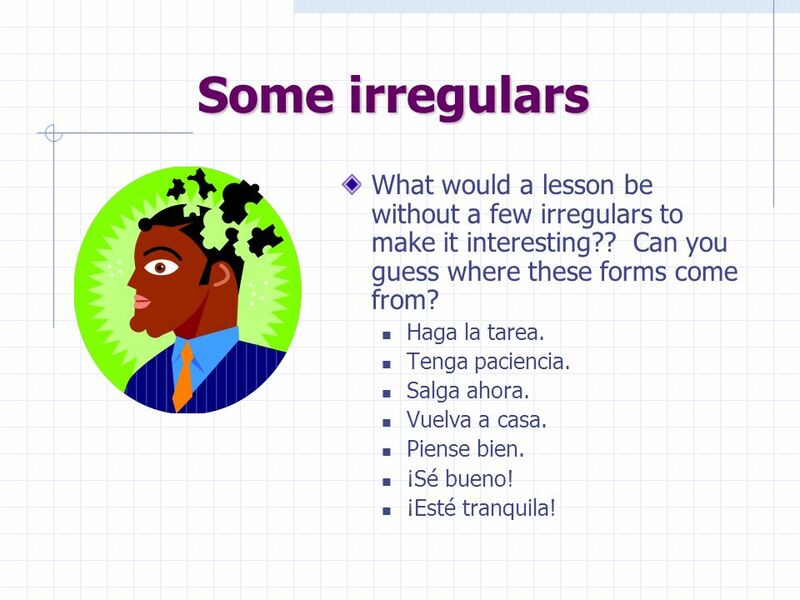 15 Some irregulars What would a lesson be without a few irregulars to make it interesting?? Can you guess where these forms come from? Haga la tarea. Tenga paciencia. Salga ahora. Vuelva a casa. Piense bien. ¡Sé bueno! ¡Esté tranquila! 16 ¿Qué pasa? Haga la tarea. Tenga paciencia. Salga ahora. Vuelva a casa. Hacer > yo hago > -o + -a Tenga paciencia. Tener > yo tengo > -o + -a Salga ahora. Salir > yo salgo > - o + -a Vuelva a casa. Volver > yo vuelvo > -o + -a Piense bien. 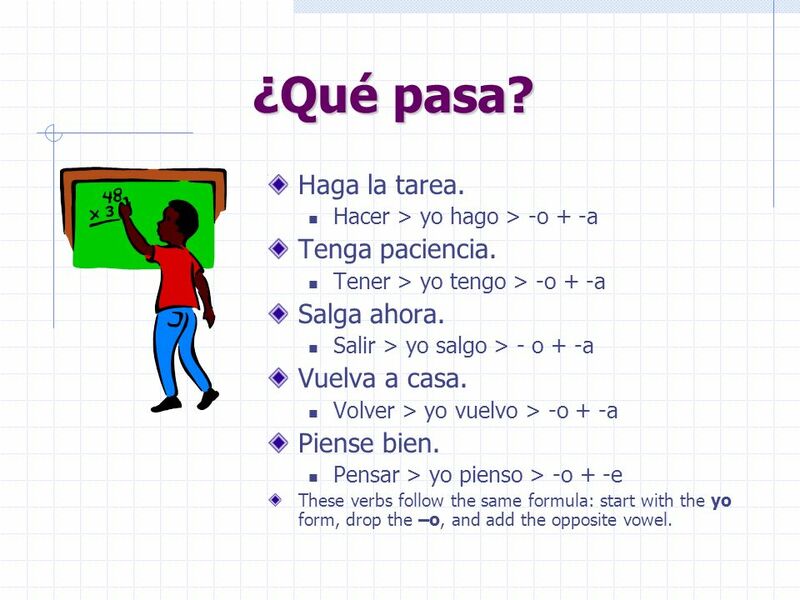 Pensar > yo pienso > -o + -e These verbs follow the same formula: start with the yo form, drop the –o, and add the opposite vowel. 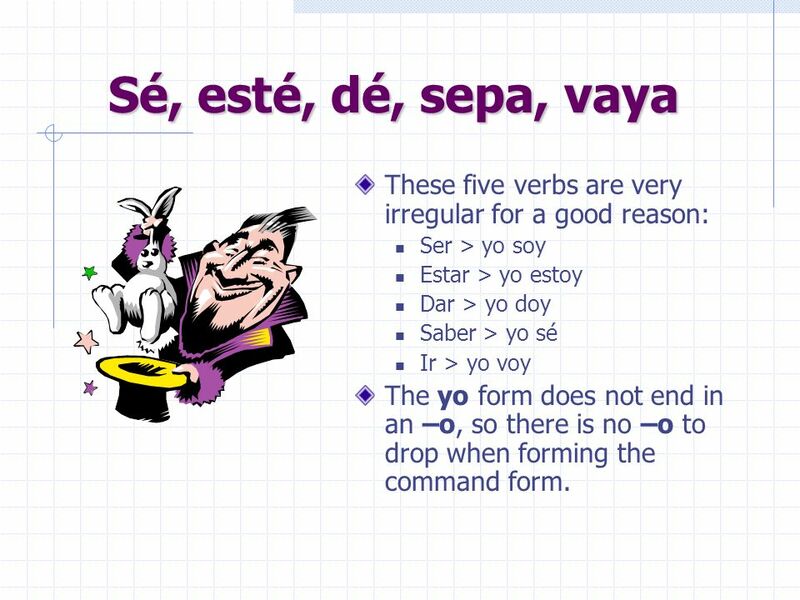 17 Sé, esté, dé, sepa, vaya These five verbs are very irregular for a good reason: Ser > yo soy Estar > yo estoy Dar > yo doy Saber > yo sé Ir > yo voy The yo form does not end in an –o, so there is no –o to drop when forming the command form. 18 ¡Terminemos por ahora! 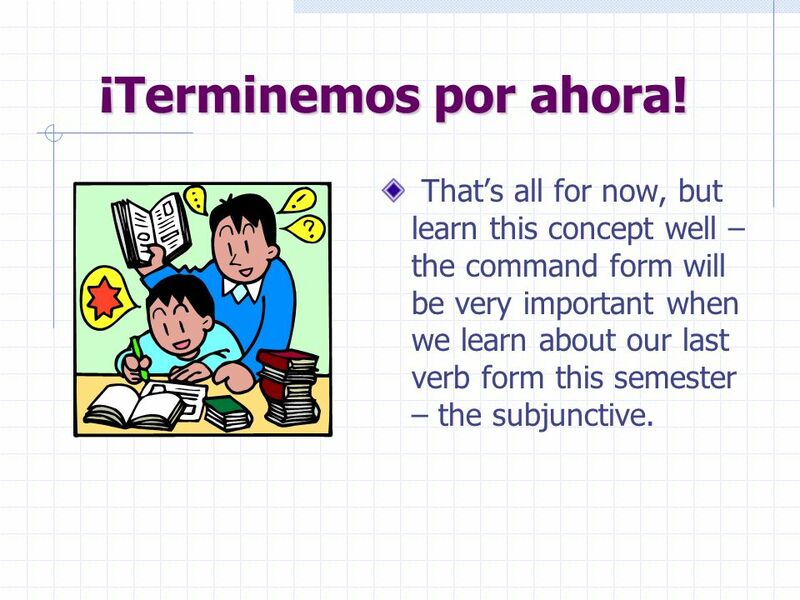 That’s all for now, but learn this concept well – the command form will be very important when we learn about our last verb form this semester – the subjunctive. 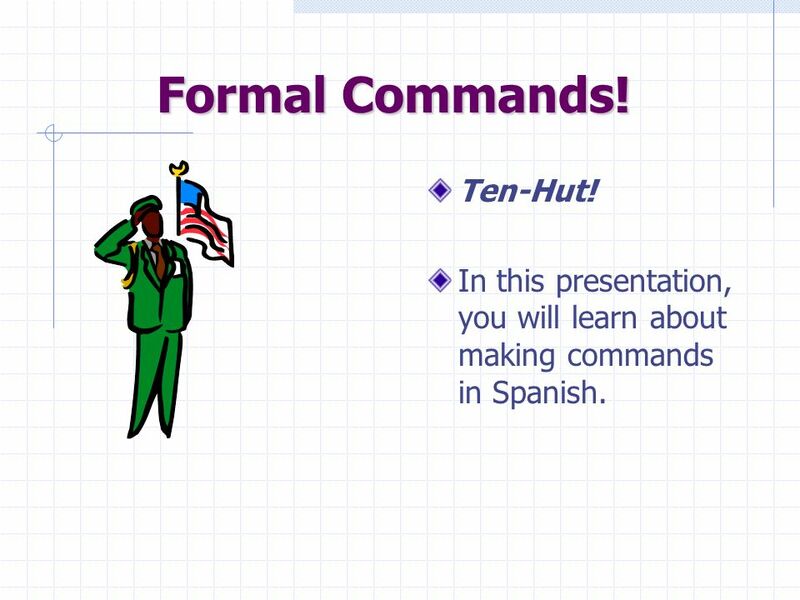 Download ppt "Formal Commands! Ten-Hut!"